The Wyoming RV park and campground links are below. If you know of any other Wyoming resources, please submit them and we will get them listed in the directory. Open year round and offers you clean modern RV sites with the best mountain views in Lander, Wyoming. Short drive from the re-created post (some original buildings) of Fort Bridger State Historic Site. Visit Labor Day weekend to catch the Mountain Man Rendezvous, complete with black powder and buckskins. Camp on the shore of beautiful Fremont Lake four miles north of Pinedale, Wyoming in the Bridger Teton National Forest. Much to offer from the view of the White Mountains rising on the horizon to watching the wild horses roam the Red Desert, to hiking the ever-changing Killpecker Sand Dunes, to fishing in Flaming Gorge Reservoir. The campground is located in the town of Bar Nunn, five miles north of downtown Casper. At an elevation of 5,284 feet, the campground overlooks the City of Casper and commands an excellent view of the city and Casper Mountain to the south. RV camping in Historic Casper, Wyoming on the scenic North Platte River, we're surrounded by wildlife, history and the beauty of nature. Settle in at this KOA sprawling across the rolling High Plains grasslands, then mosey into Cheyenne to explore a legendary cow town and Wyoming's capital city. Browse the Frontier Days Old West Museum and store. 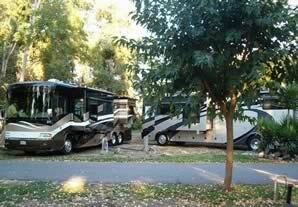 Campground has both full service and dry sites for even large motorhomes and trailers. The full service sites are equipped with 20, 30, and 50 amp electric, sewer and water. You will find several shaded picnic areas around the campground great for motor homes and travel trailers. Campground on the North Platte River and near the Laramie Peak Range of the Medicine Bow National Forest, Douglas offers an abundance to the outdoor enthusiast. Affordable, clean safe RV parking, nearby historic Ft. Laramie. A restaurant and a gas station too great for motor homes and trailers. KOA campground with mountain views just north of I-80. At the Wyoming Territorial Park, you can still peek into cells where desperadoes such as Butch Cassidy once did their time. The whole family will enjoy this recreational vehicle campground straddling the Continental Divide. Level, 24' x 80' Pull-Thrus for the largest towable travel trailers and motorhomes. Recreational vehicle camping locations in Southern Wyoming.